I would have to classify the router,or wireless router for those who's trying to correct me is no longer a luxury item,its a technical necessity. Just about everybody these days have more than one device that uses the Internet,gaming console,mobile devices and of course your computers to name a few. You need the perfect wireless router to afford you the ability to share Internet connection with all of your devices with Gigabit speed and perform well. Here's a list of some recommended wireless routers I think you should purchase,mainly because to me they are some of the best on the market. 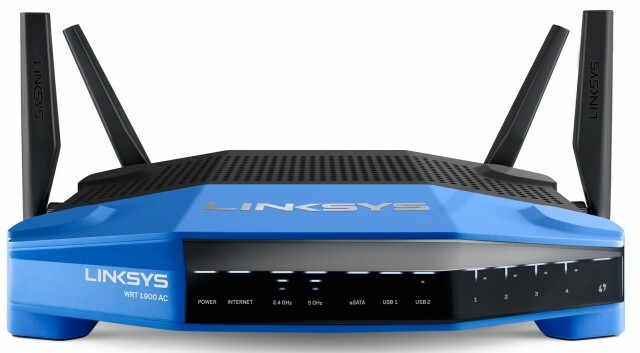 One word describes the Linksys Smart AC 1900C wireless router "Beast", it's similar to WRT54G design on steroids . This router is basically a networking geeks dream. It has pretty much the same networking technology you'll find in current generation wireless routers, 2.4GHz -5GHz dual band frequency, 802.11ac wireless standard. The WRT1999AC is enhanced in both overall size and features. It's 10 by 7.5 inches and weighs 2.25 pounds. Extra additives includes 256MB of DDR3 RAM, 128MB of Flash memory. A GigabIt WAN port, as well as four Gigabit LAN ports. On the back panel present is a USB 3.0 port and a combination USB 2.0/eSATA port. Oh yeah, let's not forget the reset switch. All of the WRT1900AC mentioned great features comes at hefty $279.00 price tag,but it's a money worthwhile spending . Very powerful router and big in size, you can probably connect many devices and still have fast data throughout. I can speak from experience and say this an excellent performing router with great range,also fast in speed. I myself has had this router sitting on my desktop for two years now, thus far I've had no issues to speak. Including my mobile devices ( tablet and smartphone) I approximately have in total 8 devices connected to this router, be it wired or wireless connection, yet not one bit of dropped performance. You searching for a router that has 2.4GHz-5GHz dual band frequencies,has Gigabit fast data speed,and have a built-in media server thus allowing you to share music and video files. Look no further than the TP-Link TL-WDR3600. For just $59.00 the router performs very well and has garnished some decent reviews from several tech publications. Yes,it doesn't have the best features around like the previous two routers I've listed in this post. For some buying their first router,the TL-Link would be the idea choice.